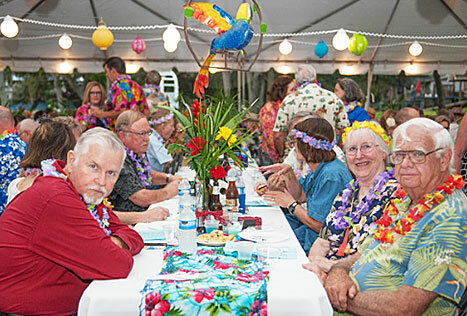 It was a beautiful fall day when 200 plus people gathered at the river to support the Friends of the River’s fundraiser “Escape to the Tropics: Blue Hawaii” on Saturday, Oct 1st. 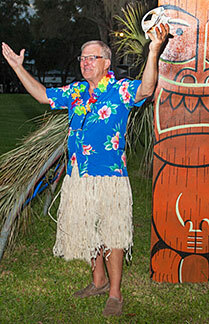 This year’s theme of “Blue Hawaii” was a remembrance of the 1961 movie starring Elvis Presley. Guiding the successful event was the team of FOR President Mike Goodson and his wife Suzanne who organized the many details ensuring the night’s success. Leis and a complimentary Blue Hawaii cocktail was presented to each attendee. The start of dinner was announced by FOR Past President Wayne Head blowing of the Pu (poo) conch shell. 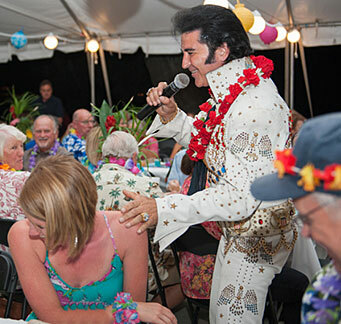 Impersonator Billye “Elvis” Wade rocked the house while attendees dined on the island-style meal. . Proceeds from the night will benefit FOR’s efforts to improve the San Bernard by river and road cleanups, River Ranger 5th grade watershed education, environmental education presentations, scholarships, advocating for opening the river mouth, and conservation easement. Thank you all for your support!!! Sponsors listed below. See sponsor ads.